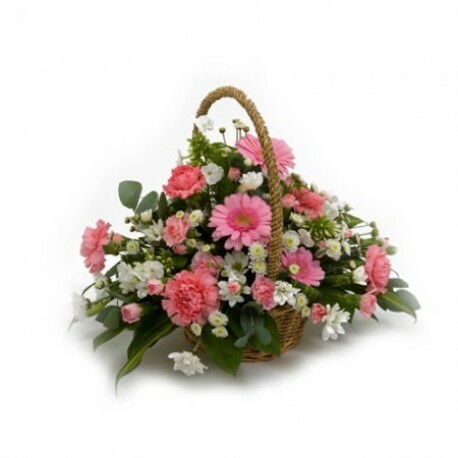 This cheerful Basket arrangement is a delight to have on any table. It's bright and colourful colour combination in a rustic basket is perfect for any occasion and includes Carnations, mini Gerbera and Chrysanthemums together with mixed foliage. The fresh cut flowers are arranged in a water retaining foam (we now use Bio oasis, which is 50% biodegradable) which holds the flowers firmly whilst providing a vital water supply to keep the flowers fresh.